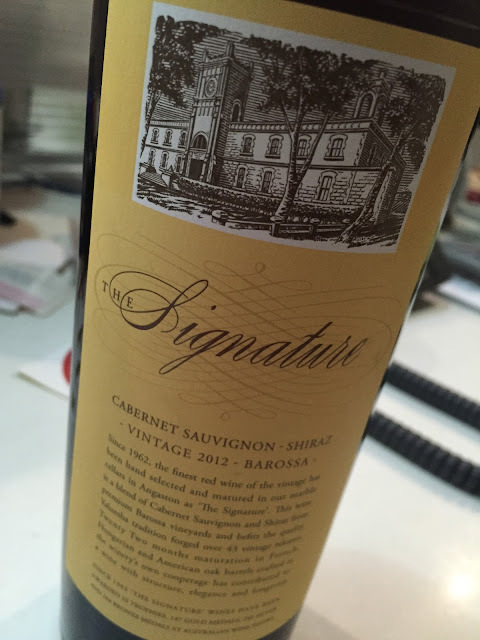 This Yalumba Signature Cabernet Sauvignon Shiraz 2012 bears the signature of Robert Hill Smith, who has just stepped down as Yalumba Chief Executive. Normally Robert picks each years Signature honoree, however he was apparently ambushed about putting his signature on this ’12. As an aside, I’ve got a pic somewhere of Robert joining in for a giant #HugWinsor record attempt. There was much hugging that day. Anyway, this is a Signature to last forever. I looked at it over about 3 hours and it just didn’t move. Nothing. Dark with a flick of purple on the edges, this achingly backward red has a nose of cedar and cocoa powder, the oak more savoury and less sweet than in some vintages. The palate, indeed, is so tight and so closed that it almost laughs at you with its intensity. Huge dry tannins, in a form that reminds me of top Rioja, make this one hugely uncompromising wine. The finish is a bit prickly and warm, adolescent and surly, but that length is absolute gold medal quality. It goes on and on and on. Drinking this now is genuinely a waste. It’s so tight and structurally wound that little is escaping. Yet that palate length is right up there at icon level, drink with your grandkids level. Score then might be conservative, but it’s just not drinkable at present. Would I buy it? For the cellar it would be a lock. Wish it was in screwcap though – a big turnoff.